Print your own custom product labels in high volumes with this digital color label press from Primera Technology! Features 4-color CMYK print engine and 8” maximum label width. There's no need to outsource your label production when you can get professional-quality results in-house! 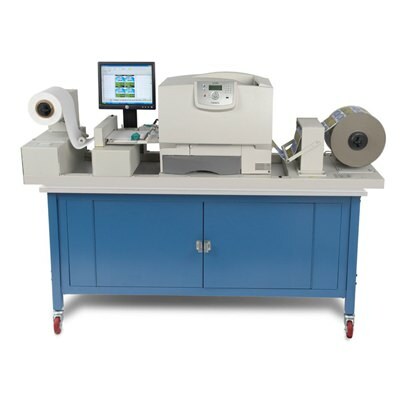 The CX1200 Digital Color Label Press from Primera delivers short-run, full-color digital label printing at a breakthrough price that small to mid size businesses can afford. The CX1200 features one of the fastest and highest-resolution color laser engines available. With its incredible 1200 x 1200 dpi print resolution 4800 Color Quality (2400 x 600 dpi), the labels you produce will be as good as (or even better than) labels produced on digital presses costing hundreds of thousands of dollars. Colors are bright and vibrant; text is sharp. Bar codes and graphics are of the highest quality. For precise color control, Pantone®-approved color support is included. Additional profiles for various substrates are available. The CX1200 blazes through labels with a print speed of 16.25 feet per minute (fpm). You can print up to 1250' feet at a time, which nominally equals a 12” diameter roll. Primera's exclusive IntelliTorque™ tensioning control system continuously monitors tension across the web. It uses this feedback to apply variable torque on the rewind mandrel. You'll get perfect, tightly wound rolls every time. IntelliTorque is a first in this category of digital label presses. From pressure-sensitive papers to white and clear polyesters and more, the CX1200 gives you maximum substrate flexibility. A wide range of approved matte, semi-gloss and high-gloss materials are available, allowing you to precisely match substrates to specific customer requirements. Primera’s micro-fine dry toner-based inks have been formulated for substrate flexibility, robustness and low running costs. Abrasion and UV resistance is among the best in the industry. The four extra high-capacity toner cartridges are easily replaced in just seconds from the front of the unit. An integrated memory chip assigns each cartridge with a serial number and keeps track of precisely how much toner remains. This allows you to select exactly the right cartridges for the number of labels and the ink coverage you need to print. You’ll never run out of ink in the middle of a job. You’ll also utilize all of the toner in each cartridge, saving you money. Whether you already own a high-end digital label press or are just getting started, CX1200 is the best short to mid-run digital label printing solution you’ll find at anywhere near its price. Primera’s industry-leading technical support personnel are here to help keep your press up and running. Technicians are available by phone and email across the globe and in most major languages. Installation, training and repair programs are also available. In selected geographies, on-site scheduled maintenance and service is also available. All regularly-scheduled maintenance can easily be performed by your own personnel. Besides toner cartridges, the only other consumables are the Image Transfer Unit (ITU), fuser and waste toner container. Primera strives to be an environmentally responsible provider of state-of-the-art digital label printing technology. As such, cartridge recycling is provided at no charge, throughout the world, for the life of the press. The result is less solid waste with fewer resources consumed. All of our products are compliant with ROHS and WEEE standards. Primera’s 33-year history of designing and manufacturing specialty color printers assures you that your investment will be backed by a strong, highly-respected USA-based company with offices around the world. Over a million printers have been built and sold in more than 167 countries. Software: PTPrint 8.0 RIP Software for Windows, easy to use graphical user interface, Primera Color System, CX1200 includes Pantone®-approved color support. One year parts and labor. Optional extended warranty available.